There’s risk every spring that a hard freeze will kill tender fruit blossoms. Virginia apple and peach growers are familiar with that risk; most are in mountainous areas in the western part of the state, where cold temperatures linger into spring. But growers across Virginia saw some losses from two hard freezes the week of April 3. The April 11 crop weather report from the Virginia office of the National Agricultural Statistics Service noted concerns about cold weather throughout the state. Snow showers hit many counties, and freeze warnings went into Southeast Virginia, where the strawberry crop ripens first. 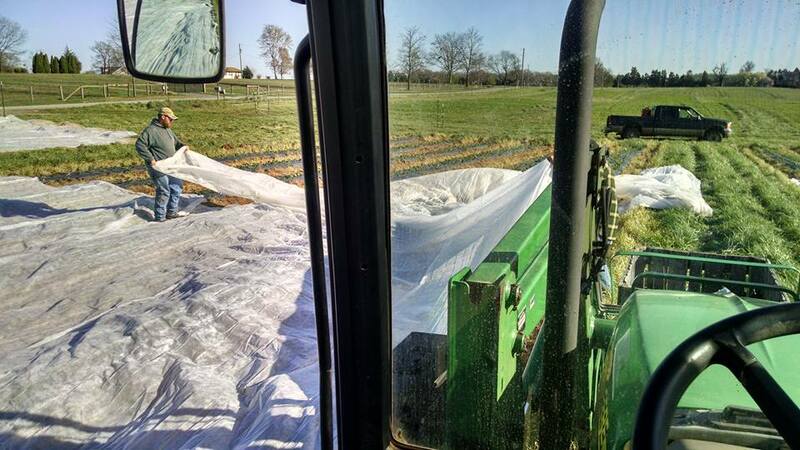 “Saturday we ran irrigation over the row covers from 11 p.m. to 9 a.m., and by doing so we were able to keep the temperature under the covers at about 33 degrees. And we didn’t suffer any additional losses,” Yankey said. Apple, cherry, nectarine, peach, strawberry and wine grape crops were hit by freezing temperatures in Nelson County, according to the report. Fruit trees in Carroll and Patrick counties also suffered a hard freeze. The cold weather delayed corn planting for growers across the state, and winter grain farmers in Eastern Virginia may have lost some yields. “The barley crop was about two weeks ahead of wheat, and the timing was all wrong” for the freeze, said David Moore, a Virginia Cooperative Extension agent in Essex County. “We’ll see some buggy-whipping and burnt ends, and now that the barley is starting to head out we’re seeing some empty heads. As frustrating as freeze losses are to growers, Yankey said he’s accustomed to hauling out his fabric row covers or setting up his sprinkler system.